Prehistoric warfare refers to war that occurred between societies without recorded history. The existence — and even the definition — of war in humanity's hypothetical state of nature has been a controversial topic in the history of ideas at least since Thomas Hobbes in Leviathan (1651) argued a "war of all against all", a view directly challenged by Jean-Jacques Rousseau in a Discourse on Inequality (1755) and The Social Contract (1762). The debate over human nature continues, spanning contemporary anthropology, archaeology, ethnography, history, political science, psychology, primatology, and philosophy in such divergent books as Azar Gat's War in Human Civilization and Raymond C. Kelly's Warless Societies and the Origin of War. For the purposes of this article, "prehistoric war" will be broadly defined as a state of organized lethal aggression between autonomous preliterate communities. According to cultural anthropologist and ethnographer Raymond C. Kelly, the earliest hunter-gatherer societies of Homo erectus population density was probably low enough to avoid armed conflict. The development of the throwing-spear, together with ambush hunting techniques, made potential violence between hunting parties very costly, dictating cooperation and maintenance of low population densities to prevent competition for resources. This behavior may have accelerated the migration out of Africa of H. erectus some 1.8 million years ago as a natural consequence of conflict avoidance. 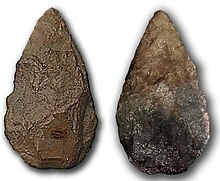 Some scholars believe that this period of "Paleolithic warlessness" persisted until well after the appearance of Homo sapiens some 315,000 years ago, ending only at the occurrence of economic and social shifts associated with sedentism, when new conditions incentivized organized raiding of settlements. Of the many cave paintings of the Upper Paleolithic, none depicts people attacking other people explicitly, but there are depictions of human beings pierced with arrows both of the Aurignacian-Périgordian (roughly 30,000 years old) and the early Magdalenian (c. 17,000 years old), possibly representing "spontaneous confrontations over game resources" in which hostile trespassers were killed; however, other interpretations, including capital punishment, human sacrifice, assassination or systemic warfare cannot be ruled out. Skeletal and artifactual evidence of intergroup violence between Paleolithic nomadic foragers is absent as well. The most ancient archaeological record of what could have been a prehistoric massacre is at the site of Jebel Sahaba, committed by the Natufians against a population associated with the Qadan culture of far northern Sudan. The cemetery contains a large number of skeletons that are approximately 13,000 to 14,000 years old, almost half of them with arrowheads embedded in their skeletons, which indicates that they may have been the casualties of warfare. It has been noted that the violence, if dated correctly, likely occurred in the wake of a local ecological crisis. At the site of Nataruk in Turkana, Kenya, numerous 10,000-year-old human remains were found with possible evidence of major traumatic injuries, including obsidian bladelets embedded in the skeletons, that should have been lethal. According to the original study, published in January 2016, the region was a "fertile lakeshore landscape sustaining a substantial population of hunter-gatherers" where pottery had been found, suggesting storage of food and sedentism. The initial report concluded that the bodies at Nataruk were not interred, but were preserved in the positions the individuals had died at the edge of a lagoon. However, evidence of blunt-force cranial trauma and lack of interment have been called into question, casting doubt upon the assertion that the site represents early intragroup violence. The oldest rock art depicting acts of violence between hunter-gatherers in Northern Australia has been tentatively dated to 10,000 years ago. Cave painting of a battle between archers, Morella la Vella, Spain. The earliest, limited evidence for war in Mesolithic Europe likewise dates to ca. 10,000 years ago, and episodes of warfare appear to remain "localized and temporarily restricted" during the Late Mesolithic to Early Neolithic period in Europe. 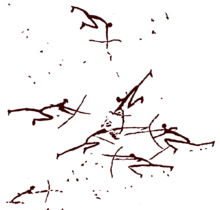 Iberian cave art of the Mesolithic shows explicit scenes of battle scenes between groups of archers. A group of three archers encircled by a group of four is found in Cova del Roure, Morella la Vella, Castellón, Valencia. A depiction of a larger battle (which may, however, date to the early Neolithic), in which eleven archers are attacked by seventeen running archers, is found in Les Dogue, Ares del Maestrat, Castellón, Valencia. At Val del Charco del Agua Amarga, Alcañiz, Aragon, seven archers with plumes on their heads are fleeing a group of eight archers running in pursuit. Early war was influenced by the development of bows, maces, and slings. The bow seems to have been the most important weapon in early warfare, in that it enabled attacks to be launched with far less risk to the attacker when compared to the risk involved in mêlée combat. While there are no cave paintings of battles between men armed with clubs, the development of the bow is concurrent with the first known depictions of organized warfare consisting of clear illustrations of two or more groups of men attacking each other. These figures are arrayed in lines and columns with a distinctly garbed leader at the front. Some paintings even portray still-recognizable tactics like flankings and envelopments. Systemic warfare appears to have been a direct consequence of the sedentism as it developed in the wake of the Neolithic Revolution. An important example is the massacre of Talheim Death Pit (near Heilbronn, Germany), dated right on the cusp of the beginning European Neolithic, at 5500 BC. More recently, a similar site was discovered at Schöneck-Kilianstädten, with the remains of the victims showing "a pattern of intentional mutilation". While the presence of such massacre sites in the context of Early Neolithic Europe is undisputed, diverging definitions of "warfare proper" (i.e. planned campaigns sanctioned by society as opposed to spontaneous massacres) has led to scholarly debate on the existence of warfare in the narrow sense prior to the development of city states in 20th-century archaeology. In the summary of Heath (2017), accumulating archaeology has made it "increasingly harder" to argue for the absence of organised warfare in Neolithic Europe. Warfare in pre-Columbian North America has served as an important comparandum in the archaeological study of the indirect evidence for warfare in the Neolithic. A notable example is the massacre at the Crow Creek Site in South Dakota (14th century). 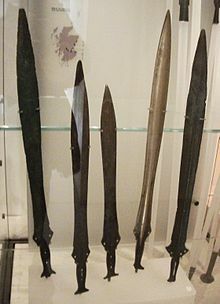 The onset of the Chalcolithic (Copper Age) saw the introduction of copper weapons. Organised warfare between early city states was in existence by the mid-5th millennium BC. Excavations at Mersin, Anatolia show the presence of fortifications and soldiers' quarters by 4300 BC. Excavation work undertaken in 2005 and 2006 has shown that Hamoukar was destroyed by warfare by around 3500 BC-—probably the earliest urban warfare attested so far in the archaeological record of the Near East. Continued excavations in 2008 and 2010 expand on that. Military conquests expanded city states under Egyptian control. Babylonia and later Assyria built empires in Mesopotamia while the Hittite Empire ruled much of Anatolia. Chariots appear in the 20th century BC, and become central to warfare in the Ancient Near East from the 17th century BC. The Hyksos and Kassite invasions mark the transition to the Late Bronze Age. Ahmose I defeated the Hyksos and re-established Egyptian control of Nubia and Canaan, territories again defended by Ramesses II at the Battle of Kadesh, the greatest chariot battle in history. The raids of the Sea Peoples and the renewed disintegration of Egypt in the Third Intermediate Period marks the end of the Bronze Age. Mycenaean Greeks (c. 1600-1100 BC) invested in the development of military infrastructure, while military production and logistics were supervised directly from the palatial centers. The most identifiable piece of Mycenaean armor was the boar's tusk helmet. In general, most features of the later hoplite panoply of classical Greek antiquity, were already known to Mycenaean Greece. The Bronze Age in China traverses the protohistoric and historic periods. Battles utilizing foot and chariot infantry took place regularly between powers in the North China Plain. Early Iron Age events like the Dorian invasion, Greek colonialism and their interaction with Phoenician and Etruscan forces lie within the prehistoric period. Germanic warrior societies of the Migration period engaged in endemic warfare (see also Thorsberg moor). Anglo-Saxon warfare lies on the edge of historicity, its study relying primarily on archaeology with the help of only fragmentary written accounts. In warlike cultures, war is often ritualized with a number of taboos and practices that limit the number of casualties and the duration of the conflict. This type of situation is known as endemic warfare. Among tribal societies engaging in endemic warfare, conflict may escalate to actual warfare occasionally for reasons such as conflict over resources or for no readily understandable reason. ^ Gat, Azar (2006). War in Human Civilization. Oxford: Oxford University Press. ISBN 978-0199236633. ^ Kelly, Raymond C. (2000). Warless Societies and the Origin of War. Ann Arbor: University of Michigan Press. ISBN 978-0472067381. ^ Kelly, Raymond C. (2000). Warless Societies and the Origin of War. University of Michigan Press. ISBN 978-0472067381. ^ Kelly, Raymond (October 2005). "The evolution of lethal inter-group violence". PNAS. 102 (43): 24–29. doi:10.1073/pnas.0505955102. PMC 1266108. PMID 16129826. "This period of Paleolithic warlessness, grounded in low population density, an appreciation of the benefits of positive relations with neighbors, and a healthy respect for their defensive capabilities, lasted until the cultural development of segmental forms of organization engendered the origin of war"
^ Guthrie, R. Dale (2005). The Nature of Paleolithic Art. Chicago: University of Chicago Press. p. 422. ISBN 978-0-226-31126-5. ^ a b Haas, Jonathan and Matthew Piscitelli (2013) "The Prehistory of Warfare: Misled by Ethnography" In War, Peace, and Human Nature edited by Douglas P. Fry, pp. 168-190. New York: Oxford University Press. ^ Keith F. Otterbein, How War Began (2004), p. 71f. ^ Horgan, John. "New Study of Prehistoric Skeletons Undermines Claim That War Has Deep Evolutionary Roots". Scientific American. ^ Antoine D., Zazzo A., Freidman R., "Revisiting Jebel Sahaba: New Apatite Radiocarbon Dates for One of the Nile Valley’s Earliest Cemeteries", American Journal of Physical Anthropology Supplement 56: 68 (2013). ^ Friedman, Renée (14 July 2014). "Violence and climate change in prehistoric Egypt and Sudan". British Museum. ^ Stojanowski, Christopher M.; Seidel, Andrew C.; Fulginiti, Laura C.; Johnson, Kent M.; Buikstra, Jane E. (2016). "Contesting the massacre at Nataruk". Nature. 539 (7630): E8–E10. doi:10.1038/nature19778. PMID 27882979. ^ Taçon, Paul; Chippindale, Christopher (October 1994). "Australia's Ancient Warriors: Changing Depictions of Fighting in the Rock Art of Arnhem Land, N.T.". Cambridge Archaeological Journal. 4 (2): 211–248. doi:10.1017/S0959774300001086. ^ Fry (2013), p. 199. ^ Keith F. Otterbein, How War Began (2004), p. 72. ^ Christensen J. 2004. "Warfare in the European Neolithic", Acta Archaeologica 75, 129–156. ^ S.L. Washburn, Social Life of Early Man (1962), p. 207. ^ Lee (2015), p. 18. ^ Christian Meyer et al., "The massacre mass grave of Schöneck-Kilianstädten reveals new insights into collective violence in Early Neolithic Central Europe", PNAS vol. 112 no. 36 (2015), 11217–11222, doi: 10.1073/pnas.1504365112. ^ Julian Maxwell Heath, Warfare in Neolithic Europe (2017). ^ Zimmerman 1981. The Crow Creek Site Massacre: Preliminary Report. ^ Martin A. Nettleship, Dale Givens, War, its Causes and Correlates, Walter de Gruyter (1975), p. 300. ^ Palaima, Tom (1999). "Mycenaean Militarism from a Textual Perspective" (PDF). Polemos: Warfare in the Aegean Bronze Age (Aegaeum). 19: 367–378. Retrieved 14 October 2015. .
^ Schofield, Louise (2006). The Mycenaeans. Los Angeles, CA: J. Paul Getty Museum. p. 119. ISBN 978-0-89236-867-9. Fry, Douglas P., War, Peace, and Human Nature. Oxford University Press, 2013. Karsten, Rafael, Blood revenge, war, and victory feasts among the Jibaro Indians of eastern Ecuador, 1923. Kelly, Raymond C. Warless societies and the origin of war. Ann Arbor : University of Michigan Press, 2000. Lee, Wayne E., Waging War: Conflict, Culture, and Innovation in World History, Oxford University Press, 2015. Randsborg, Klavs. Hjortspring : Warfare and Sacrifice in Early Europe. Aarhus, Denmark; Oakville, Connecticut. : Aarhus University Press, 1995. Roksandic, Mirjana (ed. ), Violent interactions in the Mesolithic : evidence and meaning. Oxford, England : Archaeopress, 2004.